Home » Blog » SaaS-based Apple Open Directory? As more IT infrastructure moves to the cloud, we’ve started receiving an interesting question: “Is there a SaaS-based Apple® Open Directory solution on the market?” While we are not aware of one, we think that the concept of cloud directory services has huge potential. With the ongoing move to the cloud, the real question becomes, how will organizations control user access to those solutions? The shift from solely Microsoft® Windows®-based networks to heterogeneous environments with Apple Macs® and Linux® devices is similarly challenging. Add to the mix solutions like G Suite™ and Microsoft Office 365™ that are changing how users work and where they work from, and you have quite an interesting identity management problem for IT. Can Apple Open Directory Reach the Cloud? Apple’s OS X® Server has a number of management tools for Mac networks. One of the core tools is the Open Directory software. Based on LDAP and Kerberos, the on-prem directory is optimized to manage Mac users and access. The solution has garnered a strong following in the Mac community. As those IT organizations look to move more of their infrastructure to the cloud, there’s a noteworthy challenge to consider: can the Open Directory server shift to the cloud as well? The benefits of shifting more infrastructure to the cloud are well documented, including better availability, functionality, cost, and potentially even security. Of course, that all depends upon whether the solution that you want is in the cloud. While Open Directory may not be widely offered as a cloud-based service, the concept of a cloud-based directory service can still be employed. Directory-as-a-Service solutions are cross-platform and work well with Mac, Windows, and Linux. In fact, all three platforms are treated as equals. This is especially powerful for those IT organizations that have a mixed environment. Just as Microsoft Active Directory is a not as skilled at working with Macs, Apple Open Directory has similar limitations with Windows devices. Independent directory platforms treat all three platforms as first-class citizens, ensuring user management and device management capabilities. In addition, a virtual directory service authenticates a variety of application types, including LDAP and SAML-based application authentication. Secure WiFi authentication is another aspect of the platform. Modern networks are leveraging their directory as a mechanism to control wireless access. All of these capabilities create an alternative for Apple Open Directory users with a cloud-based directory service. 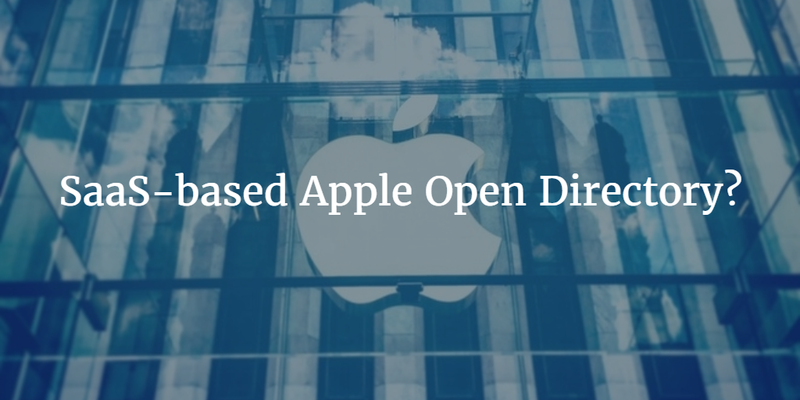 If you are interested in learning more about how you can get a similar solution to a SaaS-based Apple Open Directory solution, take a look at Directory-as-a-Service. We’d be happy to discuss with you how your Mac environment can be integrated with DaaS. Or, feel free to give JumpCloud’s Directory-as-a-Service a try for yourself. Your first 10 users are free forever.